Making time for daily artistic practice is high on my list of priorities this year, for no other reason than it lights me up. On busy days, it might be something as simple as a doodle while I'm on the phone, just for the enjoyment of the doing. When there is more time, I'm following prompts from a few different online classes/groups which are encouraging me to try different things. You really don't have to be 'good' at art to have fun. In fact, the less attached to the outcome you are, the more fun it is. Unlike knitting and crochet (or other crafts), if you consider the end product to be incidental to the fun of 'making', you can let rip, make a mess, and enjoy it even more. Historically I've enjoyed drawing people, and always wanted them to look like people, but I recently discovered the joy of mixed media art and love it. It needn't look like anything - it's just fun! With mixed media, it doesn't even matter if you don't think you can draw - you can find images and text that you like elsewhere, and turn them into something new. There's something very liberating about slapping some gel medium on the page, ripping things up and sticking them on, and then decorating over the top of it. Going back to making basic shapes with a pen is also great fun! 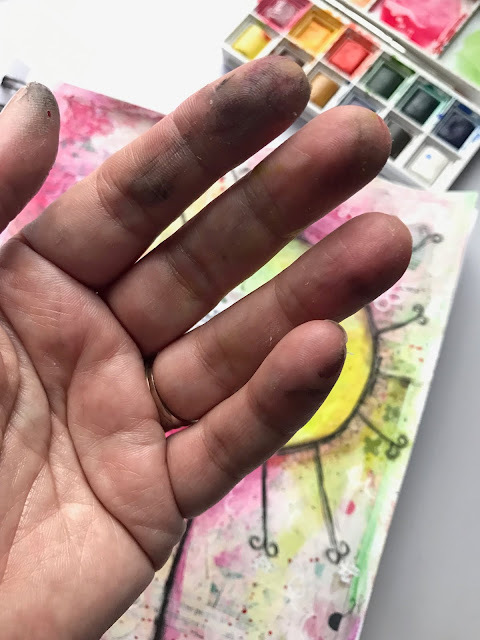 You can enjoy making art with minimal supplies - just a pen or pencil and some paper - and it's likely that you will also have some other supplies around the house, especially if you have children. (Of course, it's also possible to go crazy with supplies, but I'm not there yet!) Little Miss has been ripping up paper bags and drawing on those, then experimenting with different pens we have around the house - including adding water to the lines to make the ink run - she got some really cool effects from this and it was good practice for not being attached to the outcome, which was unknown. Even if you only have a little bit of time, you can do something fun and creative. If you'd like to be painting masterpieces, but only have time for a sketchpad doodle, the doodle is better than nothing and will probably help to scratch the itch. 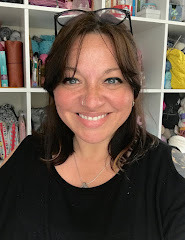 Little Miss is seven and still wants to do things with me, but she gets frustrated when I'm knitting - her knitting is much slower than mine and her concentration span isn't great when she can't see quick results. However, she is an enthusiastic artist and just loves drawing or painting side-by-side. On Sunday mornings we can often be found with the kitchen table covered in glue and paint, music playing in the background. It's a lovely way to spend an hour or two, is more productive than being sat in front of a screen, and I hope it might be a way to stay connected with her as she grows up. If you choose to let go and enjoy the process, making art - whether drawn, painted, or glued on - is very relaxing. I frequently loose all track of time and find it to be very meditative. I also find a lot of insight waiting for me in those moments, if I take a moment to listen. In these times of rushing around and constant noise, that can only be a good thing. THOUGHT FOR THE DAY: What is it that lights you up? Are you making the time for it in your daily life? What could you do to fit it in? 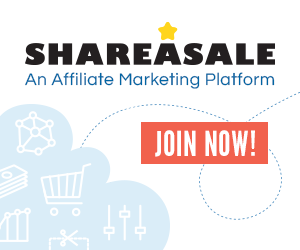 *Affiliate. 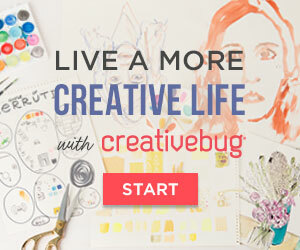 Click here to get a free month's Creativebug trial including access to ALL content (plus 30% discount at Jo-Ann in the US)!